Predicting the early exit of the Manmohan Singh government much ahead of its 2014 tenure, veteran Bharatiya Janata Party leader LK Advani said the BJP could turn the people’s anger against the regime into a decisive verdict by offering itself as a credible political alternative that promises good governance. Bharatiya Janata Party, at a public meeting here, presented a model of development, growth and good governance in states ruled by it, and sent out a signal it was ready for snap poll which, it felt, was a certainty as UPA-II would not complete its full term. Former Prime Minister Jawaharlal Nehru was of a view that a strong economy could only be achieved by combating poverty with strong policies, said HR Bhardwaj, Governor of Karnataka, while speaking at the inaugural session of a three-day national seminar on "Nehruvian Economic Philosophy and its Relevance to Cotemporary India: A Revisit" organised by the Centre for Research in Rural and Industrial Development (CRRID) here today. Brajesh Mishra, the country's first National Security Adviser who played a key role in foreign policy matters and pushed for deeper engagement with the US, died here today following heart ailment. Mishra, who would have turned 84 tomorrow, was declared brought dead at the Fortis hospital in Vasant Kunj in south Delhi, at around 9.50 pm, hospital sources said. The Andhra Pradesh Government is keeping its fingers crossed as spectre of violence looms large over the Telangana march being planned by pro-Telangana activists in Hyderabad on September 30 to mount pressure on the Centre to carve out a separate state. The CBI’s closure report into the mysterious death of deputy chief medical officer YS Sachan inside the Lucknow jail deduces it to be a case of suicide rather than murder. The stalemate over Maharashtra Deputy Chief Minister Ajit Pawar's resignation ended today with NCP chief Sharad Pawar deciding to ask Chief Minister Prithviraj Chavan to accept it. 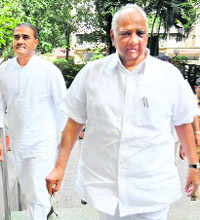 "I will ask Maharashtra Chief Minister Prithviraj Chavan to accept Ajit Pawar's resignation as Deputy Chief Minister," Sharad Pawar told reporters after a meeting of the NCP legislature party here. Taking a serious note of the rising cases of eve-teasing and molestation in the state, the Allahabad High Court may consider the constitution of a committee to monitor the situation. The spurt in rhino poaching around the flood-affected Kaziranga Park National has raised alarm in the Central government. Relieved at the Supreme Court’s positive ruling on its Presidential reference on the auction of natural resources, the UPA government today declared that its stand had been vindicated and indirectly warned the Comptroller and Auditor General (CAG) that it should not delve into the Executive’s domain of making policy choices. Aquifers in northwest — Haryana, Delhi, western Uttar Pradesh and Rajasthan in particular — and hard rock regions of South have been exploited to critical levels, India’s first ever atlas on aquifer systems has now confirmed. The Central Ground Water Board data released by Water Resources Minister Pawan Kumar Bansal shows valleys of Himachal Pradesh as having the best maintained aquifers, primarily because of quick recharge by rains. “...the tipping point in politics always comes when the people are angry and they tend to give a thumping mandate to any alternative that is credible... the BJP can prove many pundits wrong by emerging as a credible alternative. We have an opportunity to do even better than 1998 and 1999,” said Advani in his concluding address at the party’s two-day National Council meeting here. Sensing that the current political and economic situation offered an opportunity for the party-led alliance to return to power at the Centre, the veteran leader administered a pledge to the assembly to make the country free from the “corrupt” UPA Government’s “misrule” through a democratic struggle and make the 21st Century “India’s Century”. Doing some plain-talk, Advani suggested that the party leadership at all levels speak in one voice to emerge as a credible alternative and to re-affirm the people’s perception of the BJP being a party with strong commitment to probity in politics and governance. “People’s perception of a party is often much more important than the reality. I have absolutely no doubt that the BJP has a much better record in terms of being committed to clean politics and good governance. Nevertheless, we should remember that the people have much higher expectations from our party. Therefore, when it comes to even a hint of corruption within our own ranks, we must be even more intolerant and resolute when we attack the same in our adversaries. 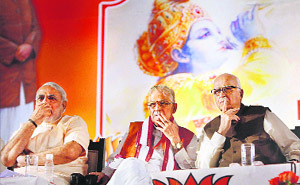 This is how we can build credibility among the people,” was Advani’s roadmap for the party. Assessing that the Congress was increasingly getting isolated, he said the anti-Congress constituency was rapidly growing, requiring expansion of the BJP-led NDA and removing apprehensions about the party by an “imaginative re-projection of our commitment to secularism”. 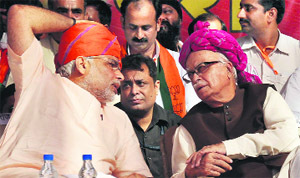 Advani condemned the controversial film on Islam that is doing the rounds on the Internet in his written speech that was circulated at the venue in a repeat of what BJP chief Nitin Gadkari had done - he, too, did not talk of the film in his speech. The party adopted the political resolution highlighting the silence of Congress president Sonia Gandhi on the “scandal-ridden” government and allegations pointing a needle of suspicion at her political aide and senior ministers suggesting names to Prime Minister for allocation of coal blocks. The party, at the meeting christened “Congress Hatao, Desh Bachao” (Oust Congress, save the country), detailed what it claimed rapid all-round progress made in Gujarat and MP through its respective CMs, Narender Modi and Shivraj Singh Chauhan. HP CM Prem Kumar Dhumal, and Shivraj Chauhan were feted by BJP during its national council session which concluded this afternoon. Bhardwaj underlined Nehru's commitment towards eradication of poverty and secular polity and stressed his insistence on Gandhian socialism. The inaugural function was attended by policy-makers and scholars from various institutes and universities to understand the relevance of Nehruvian economic policy in contemporary India. The main objective of the conference, as spelt out by Dr RS Ghuman of the Nehru SAIL Chair, CRRID, was to highlight the relevance of Nehru's economic philosophy and bridge the gap in scholarly writing related to his economic vision. Prof RP Bambah, vice-chairman, CRRID, exhorted the delegates to contribute and participate in the conference in the most meaningful way. The first technical session on the "Nehruvian Economic Philosophy and Development" was carried forward by Prof KP Kannan of the Centre for Development Studies, Thiruvananthapuram, by highlighting the need for having a fresh look at the Nehruvian economic philosophy to face the challenges of the neo-liberal globalised economy. Prof Kamal Nayan Kabra of the Institute of Social Sciences, New Delhi, argued that Nehru occupied a top position among the pioneers of post-independent India's economic growth. Brajesh Mishra, the country's first National Security Adviser who played a key role in foreign policy matters and pushed for deeper engagement with the US, died here today following heart ailment. Mishra, who would have turned 84 tomorrow, was declared brought dead at the Fortis hospital in Vasant Kunj in south Delhi, at around 9.50 pm, hospital sources said. Though the government has refused permission for the rally, the Telangana Joint Action Committee (TJAC), a conglomeration of political and social groups fighting for the statehood cause, is going ahead with the agitation programme which is likely to have serious law and order political implications. Fearing an outbreak of violence during the march, the police has tightened the security in the city with over 15,000 policemen being deployed to keep the vigil. The state has also sought the assistance of central security forces. The police is checking buses and trains entering the city. Pro-Telangana student activists, trying to enter the city to participate in the protest, are being sent back. “We are prepared to meet the challenge. We will deal firmly if any attempt is made to engineer violence,” said AS Huda, Additional Director General of Police (Law and Order). 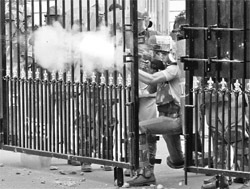 The Sunday's march has brought back bitter memories of a similar rally, christened as “Million March”, that shook the city in March 2011 and triggered large-scale violence and vandalism. The police also fears that Maoists might infiltrate the Telangana movement and join the protesters to create violence during the rally. The rally is posing a major political challenge to beleaguered Chief Minister N Kiran Kumar Reddy, who is under pressure from his party colleagues from the Telangana region to give permission to the rally. The pro-Telangana leaders within the ruling Congress are unhappy over the party high command refusing to concede to the statehood demand. Eight Congress MPs from Telangana have already announced their decision to participate in the march. The Telangana Rashtra Samithi, the BJP and the CPI, besides Congress and Telugu Desam Party leaders from Telangana, are supporting the march. The UPA leadership is treading cautiously on the raging Telangana issue. While respecting the sentiments of the people of Telangana region, the Congress leadership has made it clear time and again that it was working towards achieving a political consensus on the statehood demand. As of now, the political parties are divided over regional lines with the leaders from two regions --Rayalaseema and coastal Andhra -- strongly opposing bifurcation of the state. Sachan was a prime accused in the multi-crore financial bungling in the state’s National Rural Health Mission (NRHM) scam as well as the related twin murders of two chief medical officers (CMOs) in the Department of Family Welfare, namely Dr Vinod Arya and Dr BP Singh. In its report submitted before a special CBI court, the agency said forensic evidence in the case pointed to suicide. On June 22, 2011, the body of Sachan, who was in solitary confinement since April 15, 2011, was found hanging from a belt in an unused toilet of the jail hospital with his wrists slit and nine deep gashes on his body. Basing its conclusion on the opinion of experts from the AIIMS and the Central Forensic Science Laboratory, the CBI closure report inferred that such deep wounds could be self- inflicted. Conclusive evidence presented in the closure report is regarding the blood stains in the toilet matching Sachan's blood samples. However, the CBI has recommended action against four jail employees, including the then Inspector General (Jail Administration and Reform Services), for their various acts of omission and commission in suppressing some important evidence in the case. “There were acts of omission and commission on the part of the UP Police personnel, due to which some important evidence was suppressed,” said the report. The wife of the deceased doctor, Dr Malti Sachan, had filed a petition in the high court demanding a CBI probe, claiming that her husband was murdered as he was planning to spill the beans and name the real culprits behind the embezzling of funds under the NRHM and related murders of the CMOs. Deceased’s brother RK Sachan had charged the authorities of a cover-up as there was an unsigned suicide note found near the body, the presence of a belt and death due to excessive bleeding when no blood was present at the scene of death. He said the resignation of all other NCP ministers have been rejected and they would resume their official duties from tomorrow. Ajit Pawar, 53-year-old nephew of Sharad Pawar, had resigned on Tuesday following media reports about his alleged involvement in a Rs 20,000 crore scam when he held the irrigation portfolio between 1999 and 2009, plunging the 13-year-old Congress-NCP coalition in the state into a crisis. The NCP suspected Chief Minister Chavan had leaked "damaging information" to the media though Congress rubbished the charge, saying in the age of RTI, all information can be easily obtained. Addressing the media, Pawar senior said the NCP legislators had demanded in the meeting that a white paper on the status of irrigation projects in the state be brought out at the earliest. Explaining yesterday’s order, senior UPA ministers said the apex court had acknowledged the government’s view that policy-making lies in the domain of the Executive, auction is not the only method of allocating natural resources and that revenue maximisation should not be only objective driving this distribution. 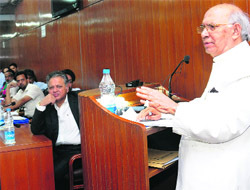 Having been at the receiving end over the CAG’s estimates of massive presumptive losses in the allocation of 2G spectrum and coal block allocations, the ruling combine today fielded a battery of senior ministers P Chidambaram, Kapil Sibal and Salman Khurshid to underline that the national auditor had exceeded its brief by questioning the government’s policies. Equipped with the Supreme Court’s order, the government indirectly cautioned the CAG that it should keep the court’s ruling in view while preparing their reports. “The implied benchmark against which loss or presumptive loss was judged by the CAG was auction. The Supreme Court says auction is not a constitutional mandate for disposing of natural resources,”Chidambaram told mediapersons today, adding that when revenue maximisation is not the objective, then auction cannot be the option. The atlas also underlines the need for formulation of micro-level strategies in forthcoming plan periods to ensure long-term sustainability of groundwater resources to achieve water and food security in the nation. The World Bank has already warned that 60 per cent of India’s aquifers would be in a “critical” condition by 2025, with 29 per cent already being in “semi-critical” state. Even though groundwater extraction has been going on for long, this is India’s first attempt to map their source - the aquifers. 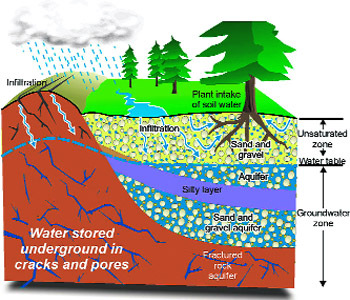 Henceforth, however, the mapping of rocks that hold and transmit the precious groundwater will be part of all future plans to facilitate formulation of groundwater management strategies. The present effort covers 14 principal and 42 major aquifers in the country on a scale of 1:2,50,000. Had it been prepared on a scale of 1:50,000, it could have covered 300 aquifers and on a scale of 1:10,000, over 1,000 aquifers. The project to “downscale” the data for better water management is in the pipeline, but it will take another seven years. Bansal said it would be better if the scale was sharp focused to 1:10,000, so that every village in the country was covered. “It will then help the farmers and the common man to understand the water level in their area,” he said. Besides the all-India atlas, atlas of Himachal Pradesh, Chhattisgarh, Tamil Nadu-Puducherry, Kerala, Karnataka and Meghalaya were also released. CGWB Chairman SC Dhiman, who compiled the data, said the foremost reason for drying of groundwater feeders was increasing demand and pressure from population - problems that were multiplied owing to erratic rainfall and slow recharge process because of the nature of soil in the region. While hard rock areas of South India have also been severely affected, the recharge process is faster in rocky areas. Within the national capital, south-west Delhi is the worst affected. The construction around Aravalli Hills has disturbed the groundwater recharge system, Dhiman said.